Paul Claude Gardère was born in Port-au-Prince, Haiti in 1944 and emigrated to New York City in 1959 at age fourteen. He earned his undergraduate degree from The Cooper Union School of Art in 1967 and his Master’s of Fine Arts from Hunter College in 1972. 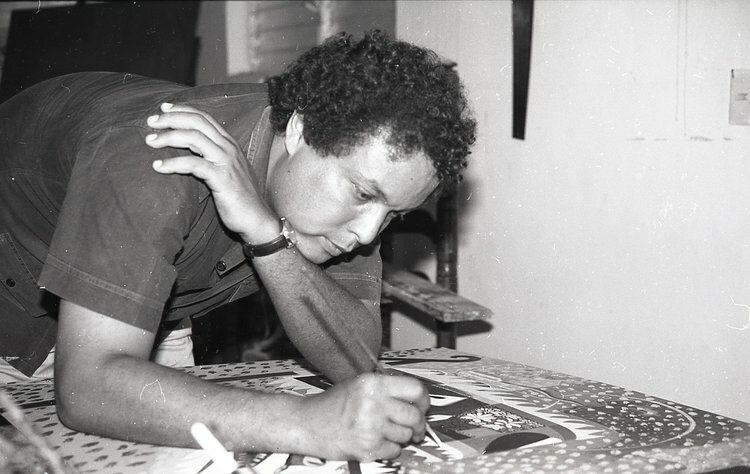 However, he felt his purpose as an artist truly began with his return to Haiti in 1978, where he lived and painted for several years with his wife and children. The family returned to New York in 1985, fleeing the threat of the Duvalier regime. Back in NY, Gardère went on to complete residencies at The Studio Museum in Harlem, the Jamaica Arts Center, Long Island University, and a 5-month tenure at the gardens of Claude Monet in Giverny, France courtesy of the Lila Acheson Wallace Foundation - an esteemed opportunity that was particularly influential for his work. ​He received a fellowship from the New York Foundation for The Arts and received the Joan Mitchell Foundation Award for Painting. Gardère had solo shows at Le Centre d’Art and Le Musee d'Art Haitien, the Figge Art Museum, the Jersey City Museum, Lehigh University, and Skoto Gallery among others and exhibited extensively in group shows in the US and Haiti. Works of his proudly reside in the permanent collections of the Smithsonian American Art Museum, Museum of Modern Art Library, the Brooklyn Museum, Le Centre d’Art, Figge Art Museum, Studio Museum in Harlem, the Jersey City Museum, and the Schomburg Center for Research in Black Culture in NY, to name a few. In 2000, Paul and his wife, Marcia, moved to the South Shore area of Massachusettes for roughly 6 years, following a professional opportunity for Marcia, a beloved Montessori school head. Paul spoke of a special quality of light near the Massachusetts coast and the environment visibly influenced his work during these years. In 2006, the couple returned to NY and resumed life in their Brooklyn home. Five weeks following Marcia's death in 2011, Paul fell ill and passed from what his doctors informally deemed "a broken heart". He was survived by his two children, Nicolas François Gardère (1973-2016) and Catherine Anne Gardère (b. 1981). Gardere's United States citizenship was awarded in 1996, but Haitian culture and symbolism remained his language for conveying ideas about post-colonial history, contemporary art, racially pluralistic identity, and cultural mixing in and beyond the Haitian diaspora.